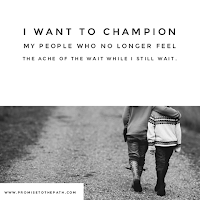 Months ago as I sat praying about our battle with infertility, I felt that special nudge to go read Hebrews - nowhere specific, just that God had something in there for me. The very first verse I read was Hebrews 6:10-14 "For God is not unjust. He will not forget how hard you have worked for him and how you have shown your love to him by caring for other believers, as you still do. Our great desire is that you will keep on loving others as long as life lasts, in order to make certain that what you hope for will come true. Then you will not become spiritually dull and indifferent. Instead, you will follow the example of those who are going to inherit God's promises because of their faith and endurance. For example, there was God's promise to Abraham. Since there was no one greater to swear by, God took an oath in his own name, saying: 'I will certainly bless you, and I will multiply your descendants beyond number.'" Imagine my surprise, excitement, and heart full of hope. This is not the first time God has given me Bible verses on having children, Abraham and Sarah, or another infertile woman in the Bible. In fact, for years He has whispered these beautiful verses to me, helping me find them at the moment when my heart wrenches and I feel myself losing hope. What a good God to care so much for my waiting, that He would breathe life even in the stillness. And yet how quickly I forget these promises. Month after month passes by, and I don't feel any closer to becoming pregnant and having children. I cling to these verses, to hope, to Jesus, and then I lay it all down at the cross, only to pick it right back up again. I sob on my knees in prayer, in worship, in surrender. I choose to see the blessings in my life, I focus on what God has given me rather than what He is holding onto for a while longer. Until I don't. Until I get angry, jealous, frustrated. I know it's silly to think God owes me anything, but how easy for our hearts to go there, isn't it? God tells us in Hebrews 3, multiple times for extra emphasis I'm sure, that when we hear His voice, do not harden our hearts. He speaks of Israel wandering in the wilderness, words that immediately grab onto my soul. 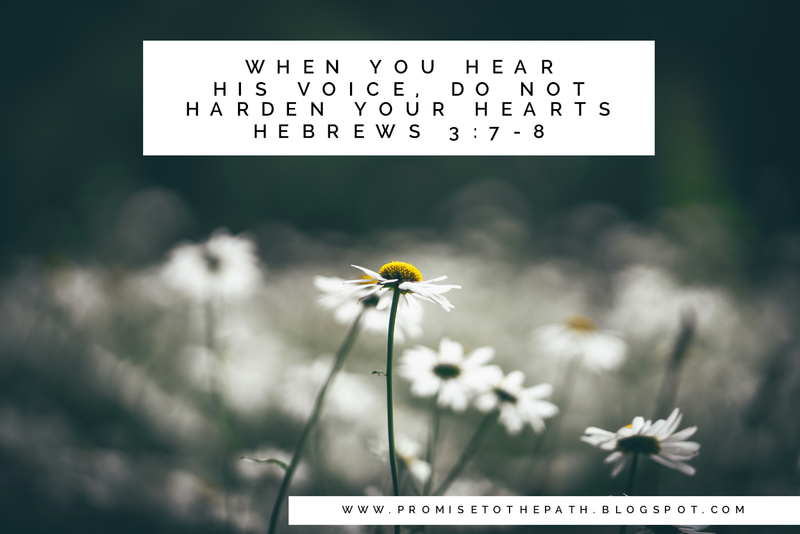 My first thought is how could we harden our heart when we hear His voice? We hear from God, what food for our heart! Yet isn't this exactly what I'm doing in my anger, my hurt, my lack of hope? I may not intentionally be hardening my heart, but it's certainly not soft, either. I'm allowing the pain of an unfulfilled promise to turn my heart to stone. Hebrews 3:19 says "So we see that because of their unbelief they were not able to enter his rest". My heart wants and needs this rest, and yet no matter what I do, I have yet to feel what I'm looking for. God's word lays this out so clearly - I have heard God's promise over my circumstance. The timing isn't up to me. Our Father is good and pleasing and perfect, and that includes His blessings, His timing, His waiting period. My unbelief, my loss of hope in a desire laid barren is preventing me from entering His rest. It's easier said than done, friends, to lean into that pain that wanders in our hearts. To know a desire from God, a promise from Him, and then to sit in a different calling we currently have. Just enough hope to cling to for the next day, with little to rest into. I know I'm not the only one. Your battle may not be infertility, but there's a dream nestled in your heart, waiting. You know the one. And when we know our desire is cradled in God's hand, let's make our own oath: that we would allow God to cradle us next to these dreams, and wait in His rest. To learn what we can, and dig our heels into hope. Continue loving others as long as life lasts, in order to make certain that what you hope for will come true. Grasp onto His goodness. Wrestle with God and like Jacob say "I will not let you go unless you bless me". Let's live boldly in these promises. Psalm 51:10 "Create in me a clean heart, O God". May this be your prayer, as it is mine.